Weight: Small fish up to 1lb are commonplace and a fish of over 2lb is seen as a specimen. 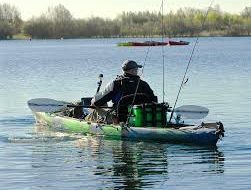 3lb fish are rare from rivers, but a number of southern stillwaters regularly throw up quality fish close to the 4lb barrier. 4lb-plus fish are very rare. British Record: 4lb 4oz from undisclosed venue in Northern Ireland to Keith Berry. Length: On average fish grow to a length between 20cm and 40cm, however on rare occasions fish of over 50cm turn up. 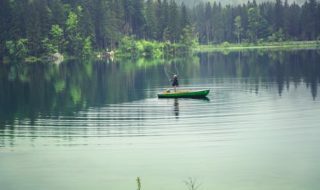 Age: In Southern England fish can live for up to 18 years, but in other areas of the UK it’s more often than not 14 years. Preferred habitat: The roach is a prolific species that is tolerant to poor water quality. They are generally found in lowland river systems and stillwaters. They are also found in numbers in brackish, tidal waters of many of the UK’s rivers. Feeding: Unfussy eaters the roach happily feed on insects and their larvae, crustaceans, snails and vegetable matter. Maturity: Males can mature after two years, but normally three. Females don’t mature until they are four years old. Spawning: Roach lay their eggs in shallow water that has dense underwater vegetation. The female will lay in excess of 200,000 sticky eggs to the plants. In fast-flowing rivers the eggs are generally laid on willow moss that’s found growing on weirs and hatches. 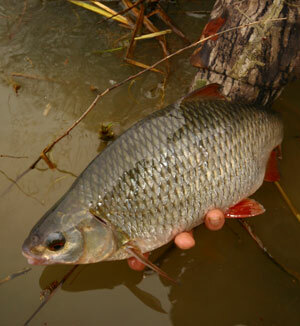 Hybridisation: Roach regularly cross breed with bream and rudd and less commonly with chub, bleak and silver bream. Natural predators: Pike, zander, eel, chub and fish-eating birds. The roach has a dark back that appears metallic blue in clear water or a greeny/brown in more coloured venues. Its flanks are more commonly silver, however, in heavily coloured waters it takes on a copper-yellow colour. The roach has a very small mouth where the upper jaw protrudes slightly beyond the lower. The large iris that surrounds a small pupil is a deep red in colour. These are a dark grey/brown in colour with a reddish tint and are convex in shape with thin rays. Slightly concave shape and dark grey/brown in colour, the fin is located directly above the base of the pelvic fin, a characteristic that helps identify the fish from a rudd. These are slightly convex in shape with thin rays and are predominately reddish brown in colour. This fin has an almost flat edge and is reddish brown in colour. I’ll Be Your Number Two! Until quite recently, roach were the most popular target species for coarse anglers in this country. Now, of course, carp have the No1 spot. But for many, the fascination remains and few fail to be impressed by the sight of the silver flanks and red fins and eyes of a big roach. Roach are probably only truly native to the southern parts of England, but have been spread across much of the rest of the British Isles by anglers, reaching Scotland and Ireland in this way. They are an incredibly adaptable species, coping equally as well with fast flowing streams as muddy, heavily stocked ponds. At an age of 3-6 years, roach will first spawn. In the spring or early summer when water temperatures rise above about 12ºC, the females lay sticky eggs that cling to weeds. Some river studies have shown that the fish choose particular types of weed (especially willow moss) which grow in quite fast-flowing stretches and it might be that roach make significant journeys to find good spawning sites. In stillwaters, submerged weeds, reeds and rushes are favourite for spawning. It’s easy to spot male roach in spawning condition because of the small white pimples, called tubercles, that can cover pretty well all of their bodies, from head to tail! It could be that the females can’t resist being rubbed with these rough pimples, encouraging them to release their eggs. A female will produce 1000-100,000 tiny egg, each only 1-1.5mm in diameter; the bigger the female, the more eggs she’ll produce. Like many coarse fish, roach produce minute fry (only 4-6mm long!) which hatch from the egg in around a week. In the river, these tiny babies need to find slack water to rest, feed and find cover; often this will be out of the main river, in quiet backwaters or off-stream ponds. In stillwaters, the young shelter in weed and reed beds, seeking especially warm and food-rich areas. Roach grow surprisingly slowly, reaching perhaps 5cm after one year, 12-15cm after three years and maybe 30cm after 10 years. Roach are known to live for a very long time, perhaps over 25 years, though 15 years is probably more normal. It’s difficult to really know how old big fish are because we use rings on their scales to tell their age (like growth rings in trees) but as the fish get older they hardly grow at all, so the gap between each year’s ring becomes miniscule and impossible to decipher! One of the reasons for the roach being generally successful in life is their ability to eat whatever’s around. When they’re tiny, roach eat minute water fleas living in the plankton but as they grow they eat a variety of water bugs (shrimps, snails, nymphs), quite a lot of weed and also rotting material in the mud (technically called detritus). 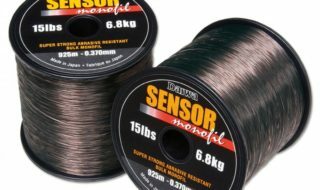 Some of the older fishing books describe the use of silk weed (a type of stringy alga) as a hook bait. It is thought, however, that the biggest roach come from waters where they can eat mostly water bugs (meat!) without having to eat too much weed. 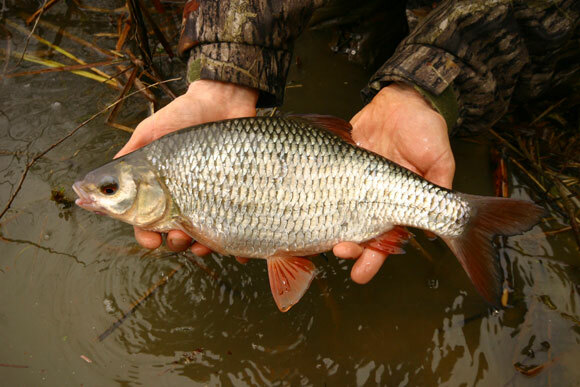 Roach commonly hybridise with other fish such as bream, rudd and even chub to produce fish that look a little like each of the parents. However, some of the hybrids (especially roach-bream) are fertile and able to breed, so if a roach-bream hybrid spawns with a normal roach, any babies could be very like a roach, so keep a careful eye out that your next big roach is not a funny mixture of species! Roach populations are commonly affected by a ‘really interesting’ tapeworm parasite called Ligula. This parasite is actually aiming to end up in the stomach of a bird, but the worm uses fish to get there! If a roach eats a water flea infected with a young tapeworm, the tapeworm then infects the roach. The worm breaks through the roach’s gut and grows massive in the cavity of the fish’s body (see photo). An infected roach looks really bloated, behaves oddly and becomes much more vulnerable to being picked off by a fish-eating bird; if it is, the worm infects the bird and finally gets where it wants to be! Roach populations infected with Ligula can go through massive cycles of good and bad years but sadly there is no treatment.